Choose firm, moderately sweet to tart apples for this recipe; Granny Smiths, Empires, and Golden Delicious work well. Depending on how sweet your apples are, you may want to add a little lemon juice to the filling. 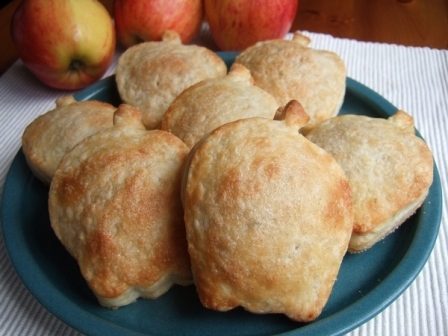 This apple filling makes about 1 1/2 cups and can easily be doubled. If doubling the crust, make it in two separate batches. The dough and filling can both be made ahead of time and refrigerated overnight. For the crust: Process the flour, sugar, and salt in a food processor about 5 seconds to combine. Scatter half of the butter pieces over the top and pulse to incorporate, about 6 pulses. Scatter the remaining butter pieces over the flour mixture and pulse until butter is the size of small peas, about 8 pulses. Transfer the mixture to a bowl, pour 1/2 cup water over the top and stir with a fork to combine. If necessary, add 1 to 2 tablespoons more water so that the dough comes together. Press the dough into a disk, wrap in plastic wrap, and refrigerate for at least 30 minutes. For the filling: Blend the sugar, spice, and salt in a small bowl. Place the cornstarch in a separate small bowl. Melt the butter in a large skillet over medium heat. Add the apple pieces and cook, stirring, until the apples release their juices, 2 minutes. Add the sugar mixture and cook until bubbly, 1 to 2 minutes. Add lemon juice, if desired, and stir. Carefully pour about 1 tablespoon of apple juices into the bowl of cornstarch and whisk until smooth. Pour cornstarch mixture back into apple mixture and cook, stirring, until the juices are thick, about 30 seconds. Let the mixture cool to room temperature before using, at least 30 minutes. To assemble and bake: Preheat the oven to 400 degrees. Divide the dough in half, roll one piece of the dough out on a floured counter to 1/8 inch thickness, and cut with cookie cutters. Repeat with the other piece of dough. Gather the scraps together, roll out, and cut. Place half of dough shapes on parchment paper-lined cookie sheet and brush with water. Place about 1 heaping tablespoon of filling on each shape. Cover each with a second dough shape and press around the edges with your fingertips to seal. Brush the top with water and sprinkle cinnamon sugar over the shapes. Make 3 slits in the top of each pie with the tip of a paring knife. Bake the pies for 18 to 20 minute, until puffed and golden brown. Let the pies cool slightly before serving.